For these reasons, it’s important to check for track sag as a part of your daily maintenance procedure. So, what are the steps that should be taken when managing track sag? If checking for track sag on a compact track loader, you should first bring the machine to a complete stop, raise the boom to a level at which the bucket can be dumped, dump the bucket, then lower the boom to raise the front end of the tracks about 8 inches off the ground. If checking for track sag on a compact excavator, rotate the cab 90 degrees and use the bucket to carefully lift one side of the machine in the air. Be sure to have your blade in an upwards position when doing so. Next, you should engage the parking brake, turn off the engine, and safely exit the cab. After the tracks have been lifted off the ground and the equipment has been powered off, check for and remove any debris that may be in between the track and the sprocket. Locate the third roller from the rear of the machine and measure the distance between the bottom of the roller and the top of the track. This distance is referred to as “track sag.” Proper track sag specifications can be found in your equipment’s operator’s manual. If the track tension is out of spec, the operator should remove the cover plate that’s located on the frame of the undercarriage. Once the plate has been removed, you will have clear visibility to the track adjuster valve and the grease fitting. To tighten a track, connect a grease gun to the grease fitting and add grease until the track idler extends far enough to bring the track sag within the equipment’s recommended limits. To loosen the track tension, slowly turn the track adjuster valve counter-clockwise, which will allow the grease to escape through the bleed hole. When the amount of track sag is satisfactory, turn the valve clockwise to tighten. 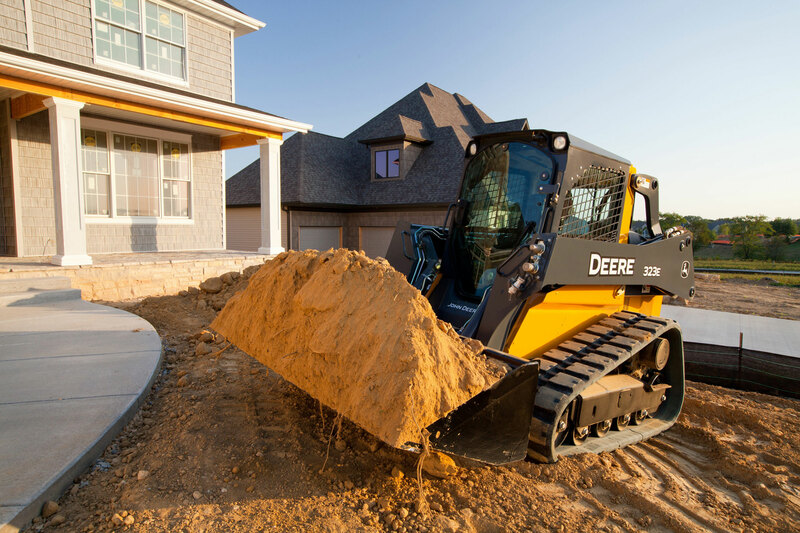 Note: the tightening and loosening process is the same for compact excavators. When the track sag is adjusted properly, the operator can reattach the cover plate, re-enter the cab, and continue on with the task at hand. Contact your local John Deere dealer for more information about solving for track sag or other questions about equipment.